Solid little sidetrek with really cool art - and FREE! 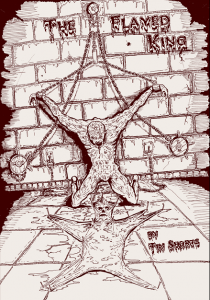 This FREE mini-adventure clocks in at 14 pages, 1 page front cover, 1 page inside of front cover, 1 page editorial, 2 pages of SRD, 1 page advertisement, leaving us with 8 pages of content, so let’s take a look! This adventure contains slightly mature themes. Nothing grievous, but if you’re really easily offended, you may want to look elsewhere. Personally, I consider this to be pretty much PG 13. The module assumes S&W rules and should best suit a party of 4 of about 3rd – 4th level characters; depending on player-expertise, lower level PCs may survive. All right, still here? Only referees around? Great! So, this module depicts a small dungeon, situated in Tullius Well. Slightly unfortunate regarding formatting of information: We have regular text, which can act as efficient and nice read-aloud text, if you choose to run the module as such; rules-relevant sections are printed in italics, which makes the discerning of spells etc. harder than it probably should be. Anyways, the well has no rules to climb down and conceals a small complex of 6 rooms – 7, really. A big plus here: There are reliefs in the doors and pressing the right ones can open a door. In a really nice twist, the first room may actually stump PCs a bit – footfalls echo. You see, the floor conceals a sealed hidden room and falling into it after demolishing it may put the PCs into a bind, as 6 draugr have been sealed here, wearing funerary necklaces for funds in the world thereafter. Here, a key may be gained by the lucky survivors. Editing and formatting are per se good – on a rules-language level, I’d have preferred hard guidelines to free the king or for the artifact, though. Layout adheres to a 1-column b/w-standard and is optimized for 6’’ by 9’’. The pdf sports two surprisingly cool b/w-artworks by Jim Magnusson – huge kudos for them. The artwork of the flayed king, reproduced herein, is fantastic and warrants downloading this. Cartography is b/w, functional and the pdf does not provide a key-less version, but the map provided does not display the secret room, so you can at least cut it up and hand it to the players. The pdf does not sport any bookmarks, which constitutes a minor comfort detriment, but not a grievous one at this length. Tim Shorts’ second Mini-manor is a solid, unpretentious little adventure. I really like the old-school mentality that makes the interaction with doors and dungeon less contingent on rolls and rather on roleplaying. The atmosphere of the small complex is nice, with particularly the flayed king having some serious panache regarding visuals etc. That being said, this falls a bit flat when compared to the exceedingly impressive “Faces Without Screams” and its innovative premise and twists, feeling more like a typical, old-school sidequest. As a commercial module, I would rate this at 3 stars – a solid offering, but nothing to truly write home about. However, this module is actually FREE. As in: $0.00 price-tag. That is amazing and frankly, the art alone warrants downloading this. Personally, I think the flayed king would warrant a bigger complex, to add to the gravitas of the situation, but yeah. The FREE nature of this pdf adds +0.5 stars to my final verdict, and since I have an in dubio pro reo policy, my official verdict will round up. A solid little adventure and, for free, one worth taking a look at. You can get this pdf for FREE here on OBS!